Home > Posts > The Proskauer Brief Podcast > [Podcast]: Can My Employees Bring Animals To Work? 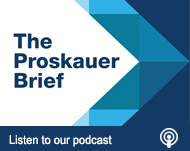 Harris Mufson: Hello and welcome to the Proskauer Brief – hot topics on labor and employment law. I am Harris Mufson and on today’s episode, we are going to continue our series: “Can Our Employees Do That?” Today I am joined by Howard Robbins. We are going to talk about service animals. The relevant issue here is, can my employees bring animals to work? I think it would be helpful to start, Howard, to start by discussing what laws apply in terms of answering that question. Howard Robbins: We are really talking about disability and discrimination laws. There is not yet in this country, with whatever other problems we have – there is not yet an entitlement to bring your favorite animal to work just because you would like to. Of course there is no reason that people are prohibited from bringing them, but the employer has the right to prohibit them subject to the obligation to accommodate somebody’s disability. That is where you get into the range of employment laws, protecting those who have some sort of disability. Keep in mind those vary; it is not just the federal law that most people heard of such as the Americans Disabilities Act (ADA), but there is also a range of state laws that vary widely from state to state and local laws that can vary. Harris Mufson: Can you give us an example of state laws that may be implicated here by this question? Howard Robbins: You may or may not be shocked that California has a more generous and employee friendly view of this issue than do some other states. In California, they have embraced not just the concept of a service animal, but the comfort animals as well. So codified in California law is that a so-called ‘assistive animal’ can be an accommodation for someone with a disability. That includes a support animal that provides emotional, cognitive or other similar support to a person with a disability, including but not limited to traumatic brain injuries or mental disabilities such as major depression. So somebody who is depressed or gets a certification from a healthcare provider saying this animal – and by that it doesn’t have to be a dog – could assist somebody with a disability. So you have a much broader range in this California law as to what somebody is entitled to in terms of bringing animals to work. Harris Mufson: How does New York law speak to this issue? Howard Robbins: New York doesn’t have that sort of definition about animals specifically, but New York has a much broader definition; a lower bar, if you will, about what constitutes a disability. A disability doesn’t have to be a permanent impairment as it does under Federal law. But even things that are just disabilities under the higher Federal standard; say depression, which is in itself a disability — if a New Yorker gets certification from a healthcare provider that he or she would be aided in managing that disability – that it would be an accommodation for that person to be able to bring that animal to work so as to be able to perform his or her job. The essential functions of the job; that is something an employer, subject to protections that it has got about the animal being unruly or causing other disruption; that is something that needs to be accommodated. Harris Mufson: So let us talk about some of the practical issues that employers face in terms of assessing a request for accommodation in terms of bringing a service animal in. As someone who suffers from allergies and is allergic to animals; I know there is a lot of those sort of people in the world. There are certainly those people in the workforce. How is an employer supposed to balance the interests between employees who may have an issue with the animal that is brought to the workplace versus accommodating an employee’s bona fide disability? Howard Robbins: It is never a reasonable accommodation. That is the touchstone. It’s not a reasonable accommodation for someone to prevent another employee to do his or her job. So if you come into work with your very, very fuzzy cat and I am sitting next to you, but I have a severe allergy to that cat such that I am unable to work in that place, you are not entitled to have the cat right next to me. It is the usual drill that employers get into. How do we accommodate somebody who has a disability? Can we move them to another area where there might not be somebody with those sensitivities? By the way, the range of animal issues is broader than just allergies. Some animals don’t behave properly. Employers are allowed to require that animals are trained so that they behave appropriately and don’t disrupt the work place. So there are boundaries. The employer is not allowed to decide for itself what it thinks is a reasonable certification or the source of that certification. You might be surprised about the range of people from whom these certifications may come. Anecdotally, I’ll tell you about a chiropractor who rendered a view for a client that I dealt with, that a service animal can be brought to the work place. You might say how is it that this person is situated, but if you go in and look at the definition of what a chiropractor is considered to be eligible to be opined upon in California it might surprise you. It certainly surprised me. So you get a range of people opining on such things; it becomes very legally problematic to start questioning the source of certification. Harris Mufson: I think no doubt people just walk through an airport and you see the number of service animals that people are with in an airport. I think it is becoming more and more commonplace that there are these licensing procedures where people can get area service animals licensed as valid comfort animals. What are some of the other animals that you have seen being designated as such? Howard Robbins: Well, there are extremes and extremes. There was an article in the New Yorker called “Pets Allowed” by Patricia Marx that appeared in 2014, where she really pushed the envelope that rabbits, milk snakes, turkeys, alpaca and a pig – that she managed to get certified as comfort animals. Howard Robbins: A turkey, right. A 26 pound turkey. She brought that turkey on the Jitney (name of a bus transportation service), which goes to the Hamptons. You can imagine how well that went over. People can get animals certified as comfort animals in a way that just might shock you. There is actually – in the same way that you see these online applications to become a minister. There are online resources to get an animal certified as a comfort animal. That really pushes the boundaries. It is difficult to question, but an employer does have the right, only within limits, to say, that animal is going to be disruptive. You can’t bring your alpaca to the work place. It doesn’t even get through the door. There has to be a limit somewhere. But if you said to me, it is a pot belly pig; it is unusual but I’m not sure if I’m going to go out on a limb so to speak and say, you can’t bring that in. As long as it is not disruptive. Harris Mufson: So we have definitely seen an increase in the number of service animal requests. I think that is what our clients have been facing. Why do you think that is? Howard Robbins: There are a couple of things going on here. Some of it is the increased diagnosis of the range of mental illnesses and the realization that those are entitled to be accommodated; that animals are often certified or deemed to be a way to accommodate those mental disabilities. Also as a generational issue –something that has been getting a lot of press in the last few years – universities are allowing students to have animals on campus to provide them comfort with what has been diagnosed as an increased level of mental disabilities and mental illness on campus. Guess what? Those people are entering the work force. They have been allowed to have animals with them for the last 4 years in college. You can be sure they would like to have them when they go to work for the same reasons. They are discovering they have the right under law to have those animals with them. So that is what employers are going to be facing; students who have had these accommodations and want to keep them. Harris Mufson: Certainly an interesting question. It is always great to hear your perspective, Howard, on that issue. Thank you for joining us today on the Proskauer Brief. Stay tuned for more insights on the latest hot topics in Labor and Employment Law and be sure to follow us on iTunes, Google Play and Spotify.